The discoveries of new superconducting materials, most of them during the last 30 years, have served very much as the context for further developments in theory which continue to the present. In many of these cases, the observations of superconductivity in new materials were completely unexpected and therefore may be regarded as real discoveries. Even the most visible progress, which followed a search using, to some extent, conventional wisdom, was finally rather unexpected – the discovery of high-Tc superconductivity in copper oxides. 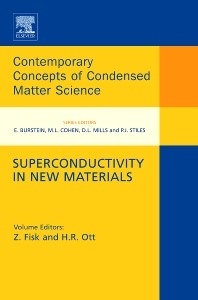 This book presents superconductivity in this materials context and displays some of the underlying simplicity in the materials record that provided fuel for the theoretical developments. Not only is the phenomenon deeply interesting, the metallic systems where it plays out are as well, and superconductivity gives a very interesting window from which to view the nature of electrically conducting materials. The level is not advanced, yet allows the serious reader to access the current developments in the literature. Addresses in detail the exciting developments after 1980. Demonstrates that progress in superconductivity is to a large extent due to progress in materials synthesis and characterization. Gateway to the current developments in the literature. Researchers and students of superconductivity, condensed matter physics, condensed matter chemistry, and materials science.